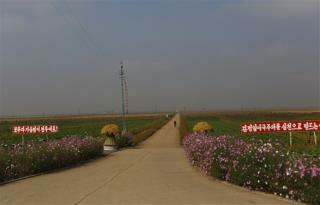 (Newser) – North Korean farmers who have long been required to turn most of their crops over to the state may now be allowed to keep their surplus food to sell or barter in what could be the most significant economic change enacted by young leader Kim Jong Un since he came to power nine months ago. The proposed directive appears aimed at boosting productivity at collective farms that have struggled for decades to provide for the country's 24 million people. By giving farmers such an incentive to grow more food, North Korea could be starting down the same path as China when it first began experimenting with a market-based economy. Communism is still the biggest danger to Humanity. Communism produced only hundreds of millions of deaths, gulags, communist death camps, starvation, oppression, mass executions - and the tremendous financial help from the USA to keep these dictatorship running (Eastern, Central European communist countries, Soviet Union, Vietnam, North Korea and Cuba, not to mention China. Communism = it's so American like applepie! i read/misread too fast. i thought it was N. korea farmers would be allowed to keep pot crops. my bad.